It sounds spacey, but British billionaire Richard Branson unveiled a rocket ship Wednesday to take tourists on an out–of–this–world ride. Standing in front of a model of SpaceShipTwo at the American Museum of Natural History, the Virgin Airways founder announced his team will begin conducting sub orbital test flights later this year. If all goes well, commercial passengers will be able to go where only astronauts have gone before — but tickets will cost an astronomical $200,000. 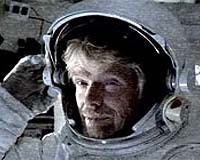 Boasting that "2008 is going to be the year of the spaceship, " Branson said his new Virgin Galactic spaceline has already booked 200 reservations. Among the hopeful passengers are physicist Stephen Hawking and former "Dallas" actress Victoria Principal. The flights will commence from a New Mexico launch pad, last about 2 1/2 hours and feature 4 1/2 minutes of zero–gravity floating time. Designed by American aerospace engineer Richard Rutan, the space contraption will carry six passengers and two pilots out of the atmosphere. Branson said the cost of a ticket will "dramatically" drop within five years of the first commercial liftoff and predicted that by 2020, 100,000 people a year will be taking the space joyrides.